I just receive my Pixcon16 board and my 16 CRC ribbon for my CRC tree which l purchased during the sale . I am trying to complete the configuration set but l can only get so far. I have run the trouble shooter and it trys to set a static address but when it does l can no longer see the board in the network software. Then l have to used the the Factory IP reset so l can see the board again but the problem still remains , l can see the board but it will not let me configure it. Light on the board show that the board is powered on and running properly. Not sure what to do next. Should l try a firmware update on the board??? Thank you for taking the time to post it all. I really hope that the developers at LOR decide to include an easier way to use these types of lights with their software. The current process, though it will works is very tedious. I check my licence and l have the professional licence, so ticket that one off the list. I am saving the Data intensity file in the PE and l am reopening the sequence in SE after completing the work. Unfortunately it not there so l must be doing something wrong..
Top of the screen or after your last controller channel in your sequence? I have watch both the videos on the PE, but l have to say that l am still struggling to get thing to work correctly. When importing and already made sequence from SE to PE. Do you remove the channels that have already be assigned in SE to your RGB props that you want to edit in PE? If yes, which is what l did. l then made a prop in PE with the same channels l had set up in the SE, completed some editing in the PE, save the work and generate the data intensity file. I must being doing something wrong but l just can not work out what..
Should l leave the channel assigned to the RGB CCR lights in the SE sequence when l open up the sequence in the PE?? I was just wondering if anyone has used the LOR software to control a moving head rgb stage light. Just updating just in case anyone else experiences the same problem. Basically the drivers that were installed on my computer for the USB, slots were not certified by Microsoft, thus stopping them for working. I always though that these updated automatically, but this was not the case this time. Once l update to certified driver the everything started working again. Can some offer some advice in plain English please. What would be the best programme to use? I have spent a lot of time looking in the forum on this topic. And the only way there seems to be able to draw a basic non CCR pixel strip in the visualizer is to use external programs that other members have created. Surely this cannot be the only way to do this. I would just like to add smart pixel surrounds to my windows frames in the visualiser. I'm also trying to set up a separate LOR and DMX networks. I have had some success but have not be able to get both the LOR networks and the DMX universe to work at the same time. 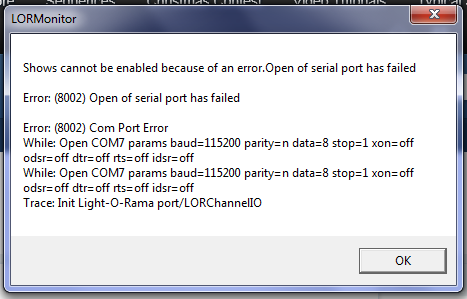 As soon as l add the LOR comm port in the network preference menu, the DMX universe stops working. Is there a simple reason or setting in the software that I'm missing. Software is s3 advance so it should be all ok. I have set up my LOR networks Regular through to AUX D on different comm ports connecting them to the LOR boards (AC, CCR's and DC boards) via USB485 adaptors. I have set up my DMX as universe 1 and it is connected via another usb485 adaptor . This has all been set up in the DMX tab in the network preference and l have selected the raw DMX protocol. I have made the required cross over cable for the DMX board and it all work OK when used by itself. I know l can run my LOR boards in DMX. However l do not want to do this. Too much reconfiguring of all the channels that l have already set up. Adding DMX controllers and smart pixels where do l start? I know this topic has been covered off many times in many other posts, and l have read quite a few of them. But I'm still not 100% sure of all the facts and steps to get DMX controllers into my display. I have 12 CCR ribbons, 6 CMB16d DC boards and 4, 16 channel AC boards in my display, and it all runs with the advance s3 software. It all runs over 4 different networks using the USB485 connector. Everything works well and l have no troubles with the set up at all. Now these run via DMX controllers and that is where all my questions start. Have to connect the DMX to a different network if l don't want the LOR controllers running in DMX as well. I can use another usb 485 connect as my dongle to allow raw DMX to go to these DMX controllers. I have to make a cross over cable from RJ-45 on the usb 485 to XLR DMX pin connector so l can add the DMX controller to the USB485 connector. I add a universe in the squencing software via net work perference and set up to the new network as well. But that's as far as my knowledge goes! Can l have more than one controller per DMX universe if l don't use all 512 channel one one controller? I can see a field for it the net work peferences screen that allow you to put in an address but you cannot change it. Can the following type of DMX controller be used? or is it limited to certain types? Can the following type of pixels be used? Has anyone purchased and added any these controllers and pixels to their displays? Any help would be greatly appreciated to help me out of the information overload forest. What type of controller do you need? Is it just a DMX controller or something else that is requires? I have a question for you about the flame projectors. I have been looking around for a while for these and was wondering if you have purchased them and what the quality was like and the cost per unit. I'll give that a go and see what happens. I had tried this first up, but for some reason it kept on giving me an error that l was 1 pixel short on one of the segments. It is now working. Not quite sure what l was doing wrong. I am trying learning how to use the Marco channels 151 to 157 on the CCR to use on the arch l have just made in the visualiser. I'm working my way through the book that came with the CCR and trying to replicate the examples on page 23 of the book. Colour effect with macro and leaping arc in blue. I have got the first one working ok, but l am having a bit of trouble with the leaping arch. The bit that l'm not sure on is when it states in step 3 "set B channel 3 to 100% -- entire ribbon is blue. Does this mean set all the individual 1-50 pixel channels above to blue? As l have tried this and see nothing in the visualiser when l play the sequence. Or is there somewhere else l should be making this setting cahnge??? I have had a look around but cannot see any obvious. Ok, l know this topic has been spoken about several times. And l have spent days reading the different references to it. Also many hour trawling the help file of S3. Unfortunately l'm still none the wiser and still not about to figure out what I'm doing wrong. All l would like to do is build an arch in the visualizer. Made from 1 ccr strip. Have that strip broken up into 10 individual segments. Have it all controlled by 1 ccr controller. Now it sounds simple enough and not as complex as two archs from the same ccr. But l just can’t get the channels to match up in the sequencer and the Visualiser. How do l get it right???? It certainly helps if your have the simple things in place. This was the same question l was going to ask. So l have given it a try and nothing is lighting up. I tried the sequence in the on demand player and the lights come on. I just need to check that l'm not doing anything wrong. As a newbee to LOR and light sequencing there is a fair chance l have got it wrong. My 12 new ccr's arrived last week, which is great news. And managed to update the units ID address and the comms port. Then the next step was to test that they worked. No worries, all look as it should on the screen compared to the manual. And presto, the pixels came on and the CCR light up. it was only for the first 6 groups of 3. I thought, may be it might be a faulty ribbon so l change it to another one. So l thought it must be me, so reviewed all my settings but l carn't see anything that would make this happen. Is the how they work on the Hardware Utility or should they all light up? If they should all light up what have l done wrong? I'm sure there is a simple answer, but l have now spent several hours tring to work it out and failed.